Two variations have thus far been located; Brazilian and PAL. There are no major differences between the two. The Brazilian version was slightly later and one of their 'blue box' games. 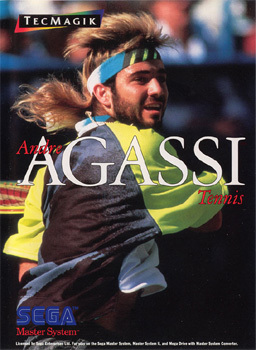 "ANDRE AGASSI TENNIS takes the same nerve and strategy it takes to be a world-class player." 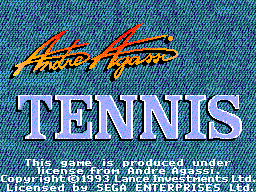 - Andre Agassi Andre Agassi's explosive forehand is yours. 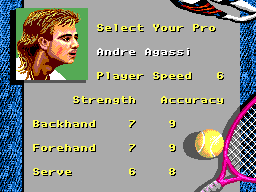 Be Agassi or play against Agassi. 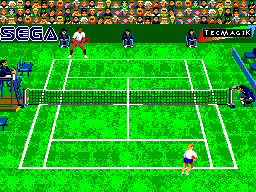 With 4 courts, 8 exciting players each with different playing styles and an umpire who calls every shot, Andre Agassi Tennis cannot be beaten.